Our Newcastle facility is a fully-approved Aston Martin service centre, staffed by manufacturer-trained technicians with years of experience, meaning you can book your car in with confidence. Meanwhile, our excellent customer service will ensure a very pleasant visit. When you come to us for your Aston Martin service, you can be sure of the highest workmanship thanks to the high standards our technicians are trained to. Their knowledge is at a calibre that makes them perfect for the job, while constant training at the Aston Martin factory ensures they are at the top of their game. It’s not just the sales side of Aston Martin Newcastle that benefits from a purpose-built, state-of-the-art dealership. Our Aftersales team also take advantage of their modern and accommodating facility where they have a fully-equipped Aston Martin service centre at their disposal. 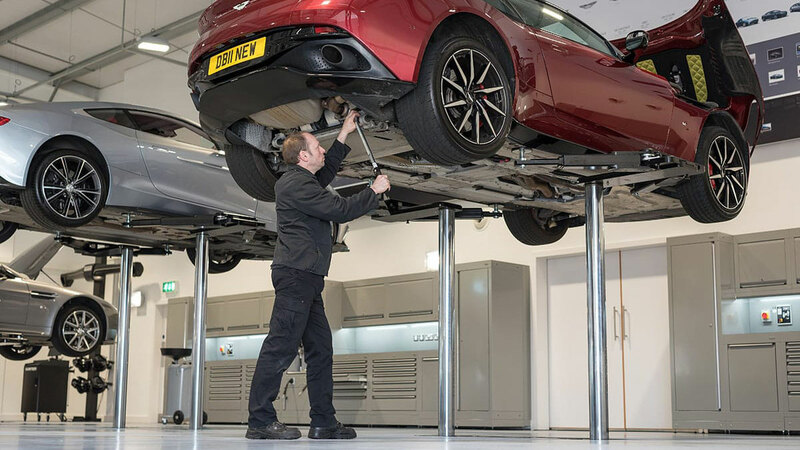 The Aston Martin service team use only genuine Aston Martin parts and specifically designated equipment, including the latest diagnostic technology, ensuring any work done on your car is fully up to manufacturer standards. Getting your Aston Martin serviced can occasionally be somewhat of an inconvenience to your daily schedule. Therefore, to ease this necessity, we have available a collection and delivery service for the North East and surrounding area. So you don’t have to book time off work or arrange alternative transport between visits to the dealership, our service can collect your Aston Martin for its servicing and return it to you once complete. We can collect from your home, work or another specified location at a time that suits you.